Ramona Zabriskie’s given name means "wise counselor" in Spanish, "mighty defender" in German, and "dreamer" in Arabic. All three come together in Wife for Life: The Power to Succeed in Marriage. Known for her empathy, passion, and humor, Ramona’s motivational speaking has taken her all over the country for over twenty years. She began focusing her live presentations on understanding men and marriage in 2008 in addition to writing three internationally popular blogs on the subject. Her subsequent personal involvement with readers and audiences from all over the world led to her work as a mentor and to the serious research and writing that became Wife for Life. Prior to Wife for Life, Ramona spent thirty years writing and directing for the performing arts and chaired a number of service organizations and events focused on women, teens, and disability advocacy. She is the mother of four and wife-for-life to Dale Zabriskie, international keynoter and corporate evangelist. Her husband, children, in-law children, and grandchildren are her biggest fans and have all contributed their varied and professional talents to Wife for Life. Though the Zabriskies raised their family in Orlando, Florida and have lived in London, England for a time; Ramona is actually a sixth generation Pacific-Northwestener. The couple now lives in their southwest Washington State dream home, just over the river and through the woods from Portland, Oregon, where the author is working on her next book. Understanding the relationship between a husband and wife is key for anyone who hopes to enter into this covenant. But it takes more to have a good relationship between the two than just loving each other. You have to be able to balance different aspects of your personalities and to not only teach him but learn yourself as well. There is a lot to learn about men and not only what they need, but how to get what you need from them. Wife for Life by Ramona Zabriskie is definitely a great guide to becoming a happy and efficient wife. If you’re not sure about entering into marriage or what it’s going to be like, then this book is very helpful. As a soon-to-be-wife myself, I was a little nervous about how things were going to go. Reading this book gave me a bit more information about how to understand a man. They really are a whole different species and sometimes it can be hard to get them to tell you what they want or need. So that’s why this book is such a great help. For any woman out there who wants to be a good wife and have a long and happy marriage, this book will tell you why and it will tell you how at the same time. I think I’ll be better prepared for my own marriage just by understanding the man I'm about to marry a little better. Wife for Life is definitely a helping hand. Ramona Zabriskie's Wife for Life: The Power to Succeed in Marriage is a marriage book to be taken seriously. Written in a personal, romantic style that women will connect with and enjoy, Ramona aims to inspire women, not just give them a how-to manual for getting your man to make love to you. Drawing on a variety of sources, including hundreds of marriage books and articles, biographies and love letters of successful people or famous marriages, and most interestingly - the personal experience of turning an on-the-rocks marriage into an "empire of love", the book has the capacity to empower women in their relationships, helping them realize they can turn the tide of boredom, dissatisfaction, or alienation in their marriages towards a relationship that is fulfilling, romantic, supportive, and filled with love! Even the good marriage is made better and the better, grand by an exploration of the principles in this book. An entertaining, flowing read that will quite literally inspire you to change your life, if you let it. Ramona doesn't just flout / tout (not sure which word is right) marriage principles; she lives with love and is an inspirational mentor to woman all over the world. She turns the clichés about men and women and the devastating divorce statistics on their heads. Read this book. You won't regret it and you'll never forget it! Dealing with stresses particular to women and combating them so that you won't have to place that burden on your husband. Understanding male psychology- especially fears and how women's fears and reactions can incite the fears particular to men. Division of labor (and support) in a marriage. Filling your "cup" of self-love by living your dreams so that you can have the confidence to nurture and inspire his dreams. Drawing him to you with her "laws of attraction" which is really all about your attitude and how you treat him. Acceptance, forgiveness, romance, respect, and so so so much more! Totally revolutionary. Makes you see men and marriage in a whole different light. You won't believe what she says at first - you'll say that may be true about some men but not my husband- and then you'll start noticing things or trying some things from the book and think "holy crap! She was right!" My husband saw "Wife For Life" on his Kindle list and asked me if I had ordered it, because he certainly had not. Apparently, it went to all of our Kindle devices, not just my own, when I purchased it. Out of curiosity, he started reading... Now, he's ahead of me in the book and is loving it! He even read to me for half an hour this morning, which is incredibly momentous because he has dyslexia and really doesn't like to read out loud. He got especially animated when he read that Mrs. Zabriskie was going to write a book for men. He asked me if it was out yet. I told him, that since this one had just come out last week, I was pretty sure that she didn't have a new one out just yet! My husband and I have been married for 20 years and don't have, what either of us would consider, an "at risk" marriage. We decided that we could both easily describe our marriage as "joyfully imperfect". We definitely have room for improvement! 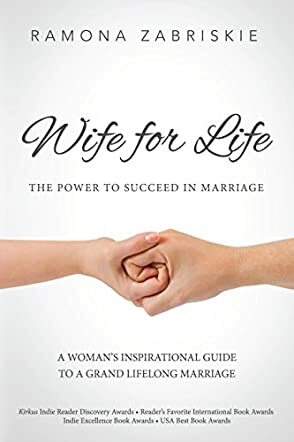 We both appreciate the wisdom and insight that Mrs. Zabriskie shares in "Wife For Life" because it is helping us to better understand each other as we move forward with building our "Grand" eternal marriage! Thank you, Mrs. Zabriskie, for sharing your "Dazzle" with the world! My husband and I are both very appreciative of your hard work and talent! Trying to save your family from attacks on every side! Read this book! Loved every word! Thoughtful, insightful and inspiring! I LOVE this book!! I love everything about this book! It's written as a friend to friend talk, the advice is insightful, wise, heartfelt, easy to understand and put into use. Wife for Life is empowering, uplifting. It's about making good, better; making better, grand and making grand, eternal. It's a guide to a partnership, helping you to understand that other half and to build up not just him, but yourself as well. I can not WAIT for Romona's next book...hurry, hurry, hurry!!! I believe if we all read this book before and during our marriages, there would be ALOT less divorce! Thank you Romona!!! Truly a wonderful guide! I've read several books on relationships over the years, but this one absolutely nails the dynamics of marital discord. The books is highly entertaining, yet filled with much wisdom about the dynamics of a marriage. I've seen entirely too many marriages where the partners sit and blame each other. Ramona makes an excellent case against helplessness, and outlines specifics on how a wife can take charge and change the situation with or without the cooperation of a husband. I can't wait until her book for guys is published! You cannot solve a problem until you know what it is. Reading this book is a gentle, but eye opening way to act with wisdom and experience joy in marriage. I received this book as a gift. I am recently married and have had a wonderful marriage so far. This book has been helpful to me as I start my marriage. Starting to work together with someone who thinks completely differently from you is an adventure. I think this book is helping me avoid major pitfalls. One of my favorite points in her book is that each person should take responsibility for their own happiness. Nobody can force you to be happy and in marriage you shouldn't rely on your spouse to MAKE you happy. While we can help each other be happy, during our day we should both do things that bring us happiness. I have been married going on 30 years. If only I would of had this book early on! The mistakes I would have avoided. This tells how to avoid, damaging your marriage. Things I could of done differently, if I would of known the long term effect it would have. What a difference it would of made. I would of had the man I was so desperately looking for. My children would of had a healthier environment, to grow up in. Some of the things she talked about I have learn by trial and error. This books puts it in clear and easy to understand language. Every bride to be should be gifted this book. Also if you are in a marriage falling apart,and you don't know how things got this crazy, this is the book for you. It is full of practical things you can do to get the love you want.this should say happy man- happy wife - happy life! Such a fun book and the personal experiences are an inspiration. After reading the book and chatting with Ramona I had a real sense of hope and excitement for the future! An extremely positive and real-life approach to marriage and understanding the differences between men and women through their ultimate goals. This book is a "must read" for wives of all ages. Ramona Zabriskie has created a manual for marriage that is so clear and beautifully written, that it is hard to put down. I would highly recommend to newlyweds so they can avoids pit falls that many young marrieds face. It is never too late to improve one's marriage at any age, so this book is for everyone. We have been married for 36 years and have a great marriage, but can see ways to improve because of the insights in this book. I would recommend it to anyone wanting to keep their marriage thriving. My wife and I of nine years recently divorced despite us both having the best of intentions during marriage. I came across this book and decided to read it to 1) conduct a post-mortem on our marriage, and 2) to glean from the book what I should look for in a wife. I found that Zabriskie very accurately describes the male condition (fears, drives, and desires), and she gives great counsel to women on how to avoid pitfalls and to build relationships. I unfortunately learned too late that my ex-wife had all of the potential to be a strong, pioneer-type dream-maker, but lacked the guidance from a good book like this and a great mentor like Zabriskie to unlock that potential. I would do anything to help others avoid the pain I've felt in the last 9 years, so I would highly recommend this book as a great tool for women to build a grand marriage and an epic love with their husbands! I feel Ramona's book has given me hope that I can have the marriage I dream of, a grand marriage! She has given me a whole new perspective on my husband, a "nice guy." I am learning that he is not my enemy; that he is uniquely himself and deserving of respect. I am excited at what the future holds for us! I have to admit that I was a bit skeptical when I first started reading Wife for Life. I've been happily (for the most part!) married for 28 years, so really, what could I possibly learn? And I grew up on the East Coast with lots of strong, highly educated, no-nonsense women for mentors and I pretty much can't stomach romance novels. So I'll be honest, Ramona's chatty, friendly and feminine tone distracted me at first. But I've learned to find wisdom from people of many voices, so I kept reading and soon her voice became that of a trusted friend who absolutely knows what she's talking about. Ramona's study of "grand marriages" has really paid off in her insightful observations of marital relationships. Even after being married for almost three decades, I experienced many "ah-hah" moments from each chapter. She definitely understands men, and I found her list of their worst fears very enlightening. As a result I better understand my husband and will be a better support and companion to him from now on. When you know better, you can do better (no matter how many years you've been married). Ramona is a well-traveled, intelligent and well-read woman. She has made a study of biographies of people with deep and loving marriages and she introduces her readers to each of them throughout her book. But maybe the most poignant of all are her own authentic stories included for our instruction. These stories are deeply personal and required humility and courage to share them. Her honesty with her own failures makes it easier to admit our own. Her success with her own marriage gives us all hope that we can do the same. If you want to be a wife, or are a wife, you can learn a lot from Wife for Life that has the power to change your marriage for the better. I believe Ramona is right when she posits that women have more power to make or break a marriage than they may think. I believe Wife for Life has the information and inspiration to save marriages, and I'll be giving copies of her book to friends and family. Even though I've not quite finished reading Wife for Life, I have already see a big improvement in my marriage. Everyone should read this book, whether you are married or single! I understand my husband's needs and behavior so much better than I did before reading this book and putting these principals into practice. Our relationship and communication has improved 10-fold and I can see it will only get better! Thank you Ramona! You have inspired AND enabled me to truly have the POWER to not only succeed in marriage, but to improve and enjoy my relationship more every day!!! Wife for Life by Ramona Zabriskie is a must read for all women. It is cover to cover packed full of information, insights, and the wisdom of experience told in a very heart-to-heart style. I really can't say enough good things about it, it's a book that you'll want to have and read again and again to keep learning from. It teaches principles that can help save struggling relationships as well as help good relationships become grand. I have searched for the answers for my entire adult life. I've had one failed marriage and was dating all the wrong men. Ramona was a dear friend of my mother when I was young and was thrilled to read her book thinking it would be an entertaining read. I got a couple chapters in and realized this book would change the way I view relationships and the way I interact with men. I'm still single, but I feel like I'm studying for the best relationship of my life. So grateful for this book and Ramona. This book has by far the best relationship wisdom I have ever read! I have been dating and reading these "how to" books for decades. I am getting married a month from now and can thank Ramona Zabriskie for the confidence that this marriage will not only work, but will be full of joy and mutual growth and satisfaction. Ramona's advice is honest and clean of the "trick the other person into thinking" that so many other relationship books employ. I cannot recommend this book highly enough. I'm amazed it is her first book. We are looking forward to her next one for husbands. Wife for Life is an inspiring book that every engaged or married couple needs to read! If you have a great marriage this book will make it better and if you think your marriage is over, this book could help save it. It is beautifully written and I know the author is was inspired. Men and women alike will enjoy and benefit from this book! I love, love, love your book. I have "read" (and I use the term loosely) several books on marriage over the years. Yours is the first to touch on the fragility and strength of the relationship. As I read, I could tell each word was carefully and thoughtfully penned for maximum impact. It is, in my humble opinion, one of the most inspired, well thought out and researched yet heart felt books ever written. What a beautifully written guide to marriage! Ramona wittily describes how each of us as women go about potentially undermining what we want most and then shows us how to get down to the business of building our great marriage and living our dreams. I have been so inspired by her words and grateful that in this time of my husband's job loss I am more prepared to be his support and intimate as we move forward together; able to face whatever life has to throw at us as a team. Thank you, "Wife for Life"! I read this book in two days--and I have already started it again (I will be reading it more slowly and taking notes this time)! I am a newbie to the marriage scene (my husband and I just hit the 7 month mark), and I am excited to use my new tools to begin our "quest for a quest" and journey toward a "grand marriage"! Ramona gave me a new point of view and allowed me to put myself in my husband's shoes. The concepts Ramona outlines in Wife for Life were familiar to me, but written in a way that increased my understanding and reminded me that I do not need to be a victim of my life--I should always be taking a proactive and not a reactive approach to my future. Reading Wife for Life has helped me to be excited for our future together, instead of fearing the bumps and low times that I know will come along our way. I loved Ramona's voice in the book. I felt like she was a good friend ...not judging but cheering me on. I also loved all of the tools she gave me to work on. I love that I can do these things on my own without feeling like my husband needs to be doing something. I have a pretty happy marriage but Mona gave me tools and vision to make it even stronger. I'm so excited about many of the ideas and feel she gave me a really clear picture of what the future can hold for us. Very inspiring. THANK YOU! This book was written with new marriages in mind...to help them be successful. I have been married for 44 years and found that not only did I learn a few new things from this book, but that Ramona outlined so many of the steps that have led to my "grand" marriage. Recognizing the things that I have found worked has encouraged me to continue and to emphasize those behaviors that Ramona suggests. It has resulted in a further minimization of conflict within our relationship. Her understanding of men is very accurate from my experience. I am recommending this to all of my daughters and daughters-in-law as I feel it can improve an already great marriage...as well as help those marriages that are in difficulties. I recommend it highly...easy reading, entertaining and, most of all, TRUE!!! If any of you have wondered how to keep your marriage going, this is the book!! I love it. Its not about changing the person you are with its about understanding them and changing your reactions to them. Men and women are so different and this book is written so that we are not putting each other down but understanding one another and how to deal with the male species. Mona has completely out done herself in this book. It is even better than I thought it was going to be. Thank you Mona for all your hard work and helping us women want to make our marriages work!! LOVE YOU!!!! I just bought the Kindle version of this book and I'm devouring every word! How does she know exactly what I'm thinking/feeling? It's amazing! I feel like I already have a good marriage, but I'm learning so much about both of us. And, if there's a way to make it "grand" then bring it on! Thank you, thank you for writing this book! Wife for Life:The Power to Succeed in Marriage is an incredible book! These are things that every woman needs to hear. Ramona's research and insight on men and relationships are life-changing. I'm seeing my husband (of 12 years) in a new light ever since I began reading the book. I understand men, now! We have a great marriage, but this in depth info about what men (and boys!) think, what they need, and who they are gives me the power to make it even better. The writing is fun and brilliant, and I will read it over and over. It's packed with good information and changed the way I see men. I read Wife for Life at the heeding of one of my newlywed friends who said that it was the absolute best wedding preparation that she could have had. I have been married for 10 years - and it has had its fair share of ups and downs. Reading this book altered my perspective not only of myself, but also of my husband and, of course, our relationship as a whole. Within a matter of days of beginning the book, a shift occurred in our marriage - a very positive shift. That love that had lied dormant for so long woke up and came out shining! Ramona Zabriskie is not only a very talented writer, with a massive arsenal of research and personal experience, but she becomes a very fast friend! Throughout the book, I felt as though she was sitting right there with me, gently guiding and directing me and helping me reframe my perspective on my marriage. She's pointed out my flaws in a loving manner and helped me turn those weaknesses into strengths with confidence. Additionally, she is available for extra guidance and support through her website, Facebook, and her online courses. This book is AMAZING! I recommend it to everyone - whether you've been married for 50 years or are engaged now. I'm reading it again and will probably read it several times more after that. It is an answer to my prayers and is steadily helping me become a true wife for life! Wife For Life is, hands down, the best self help book I have ever read. It doesn't preach, it doesn't get prosy or bogged down in information that is difficult to relate to. In fact, I would say this author has a future in writing fiction. Not that Wife For Life is fiction--it is anything BUT. It is filled with personal experiences of both the author's and all sorts of people with whom she has come in contact and mentored. She has seen marriage from many different angles and really has an accurate handle on what works and what doesn't. Mostly, she is passionate about helping everyone to succeed in marriage--you can feel it in every word she writes. I am going to have my 18 year old daughter read this because I think this information is so valuable and I want it to shape her perceptions from the get-go. Every relationship has its challenges. I would like to know the best way to do my part. keeping things interesting is important. Mrs. Zabriske has done an absolutely amazing job with this book. I WOULD RECOMMEND IT TO EVERYONE. I bought "Wife For Life-The Power to Succeed in Marriage" as soon as it hit Amazon! I LOVE it, even more the second time reading it! I've also been reading it with my husband and he loves it too! This book is going to strengthen so many marriages. It is already strengthening mine. Wives everywhere have been waiting for these insights. We can have the incredible marriages we dream of and long for. The marriages that last, inspire and continue to grow and become greater with each passing day. I believe it, I BELIEVE! This book will help you believe too. The first step to a grand marriage, is believing that such a thing is possible. This book is the first step. Im only in the very begining of the book but it has already got my wheels turning. I love how it explains that being a great wife is a talent. One that we need to study and develop. It takes time, interest, and a lot of effort to develop that "masterpiece." So much of being a good wife and mother I thought growing up would just come naturally and boy have I been surprised:) The one thing I wanted for my whole life can drive me to the very end of my rope daily. It is so wonderful to have this new dedication and knowledge to making my marriage and family great!! This is a guidebook based on the real life events and experiences of my best friend. I watched this whole story unfold from the first day, so you can imagine that I would be very anxious to read this book. I was struck by Ramona's honesty. As close as we are, she keeps certain things sacred and off-limits. That she was willing to share so many of those in this book, really took my breath away. I have watched this marriage, her own marriage, that she draws upon for each principle she teaches, from the day we all met. Honestly, it had every reason to fail, but, instead, I've witnessed it as a truly great love story that beat all the odds. And what Ramona has done in this book, is revealed the formula - she came by it organically, through trial and error, but, recognizing how it came to be, she crafted - with amazing skill, a system that can be utilized by others. I also watched her in the process of deciding this work was her life mission and how to make the greatest impact with it. What a journey she has gone through to get to this point. And I know this is just the beginning. I am so proud of her! I visualize the marriages that will turn around and grow - the joy and peace that will come to the women, their men and children who will benefit from this message . . . maybe it's you - I hope it is. Full of hope and wisdom. It really helped me understand myself and men better, gave me clarity about what it is I am really wanting from marriage, and the tools towards how to get it. Will be getting all my sisters and friends to read it! Excellent commentary written in easy-reading prose- from the Newly-wed to the "seasoned" relationship, you will find great "pearls" in this book! Thank you Ramona! I tend to be a picky reader when it comes to my non-fiction books, but this one sure caught and has kept my attention! Ramona's writing is clear, smart, and dotted with humor, too. Most of all, she is real. I highly recommend this book. Perfect book club material! This book helped shift the way I view my role as a man. I read it as a man embittered by the wake of divorce. Or rather, I began reading it as that man. I wanted to know what she did wrong and I wanted to know that it wasn't all my fault. This book showed me those things, but it showed me more. I'm speaking specifically of the part when Ramona compares a man's heart to a baby chick, held in his woman's hand. That was a very difficult part to read, because I was in a place where I wanted to be honest, but that may have been the last thing I wanted to be true. It is true. A woman is either the leaven or the lead in her family's home-baked bread. There are so many women who embrace the victim role that it is refreshing and, what's more, inspiring to observe women who own their abilities and embrace their role. I have since forsaken the victim role as well - not entirely, but I'm working on it - in no small part due to seeing the women in this movement own their's. I'm no longer bitter; I'm proactively seeking to know and perform my role for a better future relationship. It's amazing the inspiration that comes from others who are looking inward. Ramona Zabriskie's beautifully crafted words are engaging and inspirational. This is truly the best book I have ever read on female - male relations. It has completely changed my perspective. She has helped me understand better the guy's point of view and what I can do to make my dreams come true! It has given me great hope that life-long, loving, thriving, exciting, fulfilling, marriage is possible. In addition to all the great information in the book, I also loved the style it was written in. It's an easy read, very conversational in style, but it's deep enough to read over and over. Personal anecdotes are interspersed with scientific studies and wisdom gained from a lifetime of experience. I loved every minute of my read and look forward to making my marriage grand! I read this book to find a resource I could point others to if their relationships were struggling. I didn't feel I needed any help with my marriage, we've been mostly-happily married for 10 years. What I found was a detailed instruction manual on how to take my good marriage to grand that read like a long conversation. I felt like I was sitting on the couch talking to a dear friend about the struggles and joys of being married. The insights Ramona puts forward in her book are so universal to all stages of life and marriage. I particularly enjoyed the balance between fulfilling your own needs (the Pioneer Woman challenge) and making your husband's dreams a priority. I will definitely keep a copy in my library for future, frequent reference. This is the best marriage advice/how-to/information/inspiring book I have ever read. It's not a typical 'here's how to fix it quick book'. In fact it's not that at all. Ramona shares so much background of what builds a grand marriage now and throughout your life with your husband. Some of those steps are quick and easy to implement, others may take longer to implement or get in a good practice of, it really depends on where you are at and where you are coming from. Which is what adds to how personal her words are as you read and learn and discover all that this book is offering. She intertwines personal experience, she was days from court to be divorced in her first years of marriage, with scientifically proven facts about men and women's lives that make for a very interesting and informative read. I really liked how she adds the facts and it's very easy to read, not like your in a textbook for course work on marriage. One of the greatest things is that it's a book just for me, my husband doesn't have to read it, but we both are enjoying the benefits. Learning how to respond instead of react and knowing more about his processing has definitely improved our communication. And I feel much more secure with myself in taking care of myself and my needs knowing that it will in turn benefit our relationship. There are many tools that you can use right now if you picked it up today and started reading. You would feel the positive result in your life almost instantly. Other tools she presents are ones that you will continuously grow in as you live your life with your husband learning from each other and becoming better individuals, resulting in a more positive and grand relationship. It will be the book you will forever compare all other marriage books to, (if you even choose to read any others after this)and no other books will come close. It's that different and that wonderful. Get it today and then come back and get one for all your lady friends, that's what I'm going to do. This book came to me by fate. On a trip to Florida to visit a friend with one question in mind " is it time to divorce?" through my Wife for Life journey I have learned so much about myself, my husband and our blessed partnership. Instantly my marriage was not only worth saving but Wife for Life was gonna help me make a "grand" marriage. I could finally see through the eyes of my husband and better myself. I knew I had the control to have an amazing lifelong marriage and Wife for life taught me so many tools to do just that .... This book saved my marriage! This book saved my marriage! If not for Wife For Life I would now be divorced. I am blessed to have been a beta reader and be mentored by Ramona herself. I know because of this I won my husband back, we were only 4 days away from going to court. We will be married 33 years on June 24th of this year! I started applying the principles in the book and slowly but surely my husband saw the changes in me. I can never say Thank you enough to Ramona for being inspired to write this book! I bought copies for our 3 daughters who are married. I do not want them to make the same mistakes that I did. Thank you Ramona! I am forever in your debt! I love you and your marriage saving book! WOW!! What can I say but WOW??? I would like to give this book an initial review with a fresh read, and then review it again after putting the concepts into practice. So. Ahem. May I preface this with the fact that I am a writer, and I revel in a well-written book. And THIS IS SO well-written. Ramona knows her craft. I didn't doubt that she had helped many women in person, but being able to convey the essence of that into a book is a GIFT. I feel like she is my friend, a relative, a confidant telling me the honest and startling stories of her early marriage and discoveries. Ramona's right-to-your-heart feel and tremendously lovely writing style is so alluring, I have reread some of my favorite parts to my husband. And in so doing, it has opened up discussions on how I can feel EMPOWERED and know that my role as a woman is essential in making our marriage work. The book is not pretentious or hyped, but solidly backed by and incredible spread of research and experience. Oh, and did I mention that Ramona is funny? I am a very quiet reader on the whole, but the event that led to the joint read with my husband was irreverent snort-laughter. From my bed (where I usually fall asleep before I get through any first page, except for The Hunger Games and Tuesdays with Morrie), I created such a raucous while reading that my husband could no longer concentrate on the important business e-mail he was composing. So I say, as my initial review: This is a grabber. The sample got me hooked and the Kindle version that I purchased is just right. You will find valuable information from the get-go, without any lag. Now I'm going to finish this puppy and see how the view-alterations help this 14-year marriage of mine mature in new ways. How EXCITING. I'm a newlywed and I am so grateful I made reading this book a priority on my pre-wedding "to do list." It should be required reading for anyone preparing for marriage or was recently married. Zabriskie targets the women who are married to "Nice Guys" as in they are well intentioned, kind, well meaning but far from perfect (just as we are far from perfect). She makes it quite clear that if you are in abusive or harmful relationship that you should seek professional help and that her book is not aimed at this audience. Nevertheless, this book is a relatively inexpensive form of marriage counseling/ therapy and far more fun and rewarding to read this book than to go through a divorce. One of the strengths of the book is that the author's conversational style is warm and inviting. I appreciate that I felt like Zabriskie was speaking to me as though I were a good friend and we were having a long "girlie chat." Furthermore, I appreciated that while she drew heavily from her personal experiences, she supported her assertions with professional opinions, studies and research. Together her argument is wholly compelling as it appeals to both the emotional and logical aspects of how men and women interact. I also appreciated Zabriskie's approach in that she offered practical advice so you knew how to apply the ideas she presents in her book. Additionally, as I read the book, I immediately wanted to share it with all my friends so we could discuss it. It is the type of book that would spark a dialogue and could make quite interesting material for a book club. Although I am still new to being a wife, I appreciate this positive, hopeful and inspiring look at how to build a happy, long lasting and successful marriage. We need more material like this in this day and age. I absolutely loved this book. As a marriage and family therapist, I can say that this is the best and most helpful book on marriage that I have ever read. It gives a solid explanation of typical dynamics in marriage and gives specific suggestions on how to improve a marriage relationship. The author gives personal examples of the principles she teaches in the book, which makes the book enjoyable and easy to read. Very few, if any, marriage books lift and inspire like this book does. I would highly recommend it to any married woman or any woman considering marriage. This book has reminded me of why I am happy to be married and inspired me to build an even stronger marriage. This book will change lives. What a wonderful book! I thought I had a good marriage, but I discovered things I needed to change to have a better marriage. Ramona's writing style is delightful and her examples are so illustrative. I now include this book with all my gifts for new brides. Wife for Life was not just thought provoking and enlightening, but an enjoyable read as well. There are lots of self help books out there that may be helpful, but are practically impossible to get through. Ramona is witty and energetic, and her anecdotes are things that I could relate to. Being only a year into a second marriage, I have found Wife for Life to be an amazing resource. It has given me confidence and hope that we can make this work! Wife for Life is a "how to" guide we all wish we had when we got married. Ramona's lighthearted style is engaging, and her message is poignant--marriages will stand the test of time if we learn how to make them grand through a lot of effort on our part. While many of us know it takes effort, we don't know WHAT to do! Through her rich treasure trove of stories from her own life that help us get to know her throughout the book, she clearly outlines what NOT to do if you want a healthy marriage, but more importantly she tells you very clearly what TO do. She freely exposes her own failures and triumphs in her marriage and inspires hope that each of us can overcome challenges to make our marriage grand. A wonderful read!